I was able to witness a nice orange sky last Tuesday night as the clouds slowly took over the sky above. This was taken at the beach in Neskowin looking north towards Pacific City. 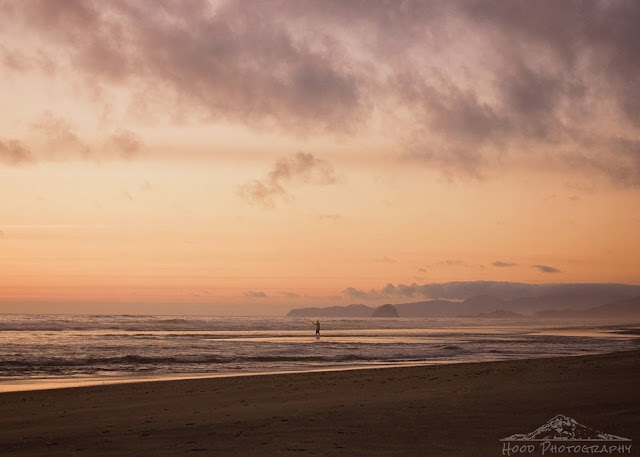 My friend was taking advantage of the last moments of fishing in the waves, and beyond you can see Haystack Rock silhouetted against the foothills. Beautiful colour in that shot! A lovely beach scene and beautiful colors. Lovely sky shot! Have a happy weekend! Awesome capture!! Such beautiful skies and we do have lots of them here in the northwest, don't we!!! Hope you have a great weekend!! Beautiful orange sky! Great photo and color! ~ Almost a painterly sky look! That is really so very beautiful and it has such a peaceful mood. Ah what a peaceful scene. I love the lone fisherman out there! A beautiful image. Wow oh Wow this is beautiful We live in the Portland, Oregon area and have said that the sunsets have been awesome lately. Thanks for sharing. Visiting from Little by Little. A great capture for OGYGIF.